Eight individuals and five organizations received a Union County Human Relations Commission Unity Award for Achievement, an honor annually bestowed upon those who dedicate their time and efforts toward volunteerism and philanthropy in Union County, during a special presentation held Monday, May 8 at the Kean University STEM Building in Union Township. The 2017 awards marked the 16th year in which the Commission has named Unity Award honorees. Two local students received the Unity Award for Achievement by a Student: the first, Nicholas Tarabokia, is an eighth-grader in Berkeley Heights who was honored for his efforts to improve the quality of life for children and their families affected by cancer through advocacy, charity, and support. At age 6, three years into a diagnosis of leukemia, he wrote down the words “cancer stinks.” At age 8, he turned those words into a mission to help other children overcome their anxieties and fears while they battle the disease, and with the help of his brother Ryan and his family, he founded the Cancer Stinks Children’s Foundation, which has delivered more than 5,000 care packages in its six years of operation. Imagine: A Center for Coping with Loss, received a Unity Award for its efforts dedicated toward the strong belief that no child should have to grieve alone. The Center provides free, year-round bereavement support in a safe environment for grieving children, teens, adults, and families who are coping with loss, providing them with the opportunity to become part of a larger support system and make lifelong friends. Director Mary Robinson accepted the Award on behalf of the Center, which recently moved to Mountainside from its original Westfield location so it can expand its services to more children and families. 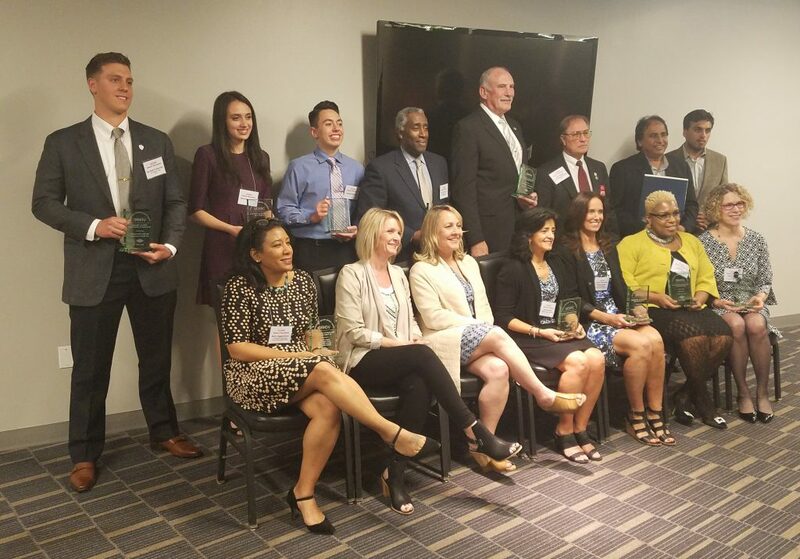 The Union County Court-Appointed Special Advocates (CASA) volunteers received a Unity Award for Achievement in Public Service for their efforts to care for many of the nearly 600 children in Union County under the age of 21 who are currently in foster care. Sworn in by a judge and empowered to speak to foster parents, teachers, doctors, lawyers, tutors, therapists, and more, these volunteers help their assignees gain access to an education and other services that meet their specialized needs, and make recommendations to a family court judge to ensure that each child’s best interests remain prioritized. The award was accepted by CASA Executive Director Maria Higginbotham. Retired Westfield Police Lieutenant James Schneider, for a highly distinguished 30-year career in law enforcement, but also for his lifelong commitment to save lives and lend a helping hand to fellow policemen and women struggling with substance abuse. A longtime volunteer with the Cop2Cop suicide prevention hotline service, he has also made himself available 24/7/365 for any officer in need and their family members. Plainfield Auxiliary Police Division Captain Wally Torian, for almost four decades of volunteerism, community service, and civic activism, including his 36-year career as a volunteer auxiliary officer. His many volunteer activities, including acting as a mentor, counselor, and coach, have provided him the opportunity to protect children and encourage young men who might not have been looking to further their education begin or complete their college degrees. Robin Johnstone and Melissa Thompson, two Union County mothers who founded of Missions Possible of New Jersey to make a difference in the lives of children and families who fall victim to misfortune, whether via neglect, abuse, or abandonment, by collecting and distributing gently used household items and furniture, toys, and clothing. Terri Todd of Linden, for creating a creative mentoring program called The F.A.B. (Fashion Against Bullying) Coalition. The Coalition’s efforts focus on using fashion as a tool against bullying by providing a safe harbor where students of different backgrounds and interests can create their own style and express themselves while working together on common projects and goals. The annual culmination is hands-on business exposure and education by participating as a team in New York City’s Fashion Week. Mobile Meals of Westfield, for 50 years of service providing well over one million healthy meals to homebound individuals who are elderly, live alone, or sick. The Mobile Meals drivers, who sometimes are the only other person to visit meal recipients on any given day, develop a relationship with those they meet on their routes, and also monitor health and well-being. Director of Operations Josephine Walsh accepted the award. American Muslims for Hunger Relief, for serving the hungry and homeless with compassion, dignity, and respect, without discrimination of any color, race, gender, or religion. This nonprofit group currently serves 10,000 meals every month in New Jersey, New York, Pennsylvania, and Maryland. Carolyn George, Recreation Coordinator for the Berkeley Heights Recreation Department, for her efforts serving as a tireless and inspirational leader and role model for her community, and her “above and beyond” contributions that have enriched the lives of the residents of Berkeley Heights. Two veterans were also honored Monday evening, both for their dedicated service to our country and for their continued commitment to support fellow veterans, especially those who are homeless, jobless, and, in many instances, friendless. Award recipient Kevin Murphy, a Roselle resident, previously served in the U.S. Air Force, New Jersey Air National Guard, New Jersey Army National Guard, and the U.S. Army. In addition to active service to community organizations including the borough’s Rotary Club, First Aid Squad, and Chamber of Commerce, he also founded the local Veterans Chamber of Commerce, which recently combined its resources with Operation Chillout, an all-volunteer outreach program to homeless veterans. In addition to providing emergency supplies and survival gear to some of the most vulnerable members of the community, he also runs backpack and clothing drives, and raises funds for special equipment needs. Recently retired U.S. Marine Corps Sgt. Brett D’Allessandro, whose service included a tour of duty in Afghanistan, was also honored Monday. Upon encountering a homeless man holding a sign that read “Vietnam Veteran” several years ago, Sgt. D’Allessandro immediately went home and filled his service backpack with clothing and returned to find that man and give it to him. Thus the nonprofit group “Backpacks for Life” organization was born, and it has distributed more than 2,300 such care packages since. For more information about the Human Relations Commission and the Unity Awards, go online to www.ucnj.org/uchrc.